We are extremely excited to announce that come January 2019, we’ll be kicking off Season #1 of The Big Ski Family (TBSF) Winter Tour hosting Family Ski Days at select partner resorts across the western United States. This will be our first official series of Family Ski Days. We couldn’t be more excited to roll out the white carpet and shred with you! What are Family Ski Days? Family Ski Days are an opportunity for you to come ski with our crew at your local (or favorite!) ski resort. Do Family Ski Days cost money to attend? You’ll need to purchase a regular lift ticket from the resort or use your Ikon Pass as you normally would. There’s no additional cost to participate in Family Ski Days. 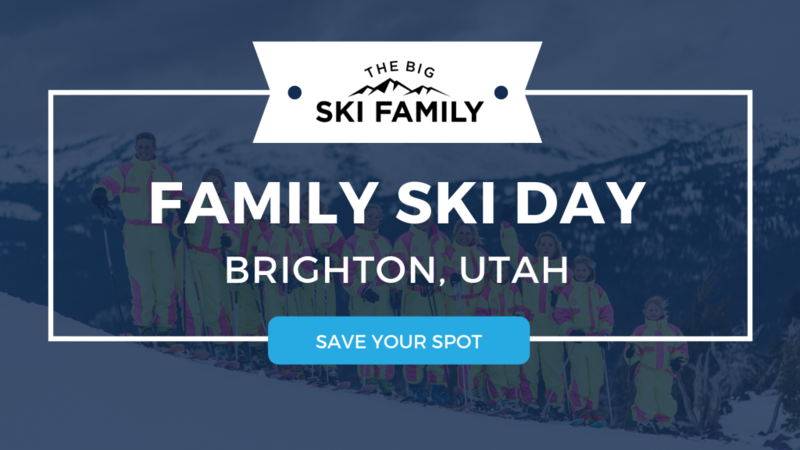 Just RSVP for the Family Ski Day on Facebook or Eventbrite. Then meet us at the designated spot (you won’t be able to miss us in our day glo onesies!) and get ready for an epic day of skiing with the crew! What do I need to bring to a Family Ski Day? For starters, be sure to bring your lift ticket, ski gear (skis, helmet, goggles, gloves, etc. ), and anything else you’d regularly bring with you to the mountain. Have a spouse, partner, kids, or friends that you think would like to join us, too? Bring them, too! The more the merrier. A passion for skiing, a cheerful heart, and a positive attitude are all that’s needed. What should I expect at a Family Ski Day? #1 Morning Meetup: Meet at a designated Low Intermediate Run – Groomers. We’ll wait 15 minutes before loading the lift and skiing the designated run for the next 2-ish hours. #2 Lunch Meetup: Meet for lunch at a designated location at the lodge. Bring your own or buy lunch in the lodge and meet us for an hour of social time together. #3 Afternoon Meetup: Meet at the bottom of an advanced chair for some whole family rat packing the steeps, bumps, and trees. #4 Apres Ski Meetup: Meet us at the bottom of the resort near the lodge to wind down after a long day and hang out. Specific locations to be determined! Skiing together has helped our family learn new skills and gain memorable experiences. We know firsthand that family ski trips foster a sense of adventure and fun that lasts long after the trip has ended and the snow has melted. Our mission is to travel the world and introduce 1 million families to the joys of skiing and our first run begins at Brighton Resort on January 5, 2019. If you live in Brighton or will be in the area this day, we’d love for you to come join us, even if just for a few runs together. Can’t make this trip? Don’t worry! Browse our upcoming Family Ski Days here so that you can RSVP for a day that works for you, add it to your calendar, and help us achieve our goal of introducing 1 million families to the joys of skiing together. Don’t forget to subscribe to our YouTube channel to stay up with our weekly vlogs, too!